Welcome to Máire's website. Here you'll find biographical information about Máire, her duo with virtuoso guitarist Chris Newman, her trio with her sisters (The Casey Sisters) - and their CD Sibling Revelry - The Heartstring Quartet with Chris, Nollaig Casey and Arty McGlynn (Máire's fiddle-playing sister and legendary Irish guitarist respectively), tour-dates, press reviews, features and interviews, a festival list, information about recordings and books, video and audio clips, and contact details. Promoters: Chris and Máire's duo website is here. An online brochure about Máire and Chris can be found here on the present site. Downloadable high-res photos of Máire and Chris, publicity materials and technical specifications can be found here on our sister Old Bridge Music site; downloadable quartet materials are here. 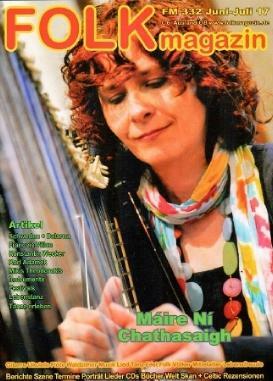 Máire's CDs and books can be ordered from our OBM online shop. We'll add new pages as they become available, so please bookmark this site and come and see us again! Máire's major news for 2019 is that on May 1st in the National Concert Hall, Dublin, she will be the soloist with the Irish National Symphony Orchestra in a concerto for Irish harp (the first such concerto) commissioned by RTÉ Lyric fm for its 20th birthday and written for her by composer Ryan Molloy. Máire and Chris have had a super-busy 2018 - four North American tours, during which they visited Colorado, New Mexico, Vermont, Massachusetts, Connecticut, New York, New Jersey, Maryland, Illinois, Missouri and Ontario, a month-long tour of New Zealand, tours in Ireland, the UK, Italy and France, several festival performances - Temple Bar Tradfest, Dublin, Celtic Festival of Southern Maryland, Spring Rain Festival, Ontario, Gower Folk Festival, Wales, Old Songs Festival, NY, International Festival for Irish Harp,Termonfechin, Co. Louth, Catskills Irish Arts Week, NY, Festival on the Green, Middlebury, VT, Somerset Folk Harp Festival, NJ, Fiddler's Green International Festival, Rostrevor, Co Down, Beppe Gambetta Guitar Summit, Santa Margherita Ligure, Italy, Kelso Folk Festival, Scotland and Wellington Folk Festival, New Zealand - and their sixth annual Christmas tour in the UK. In addition, the 2018 Cork Folk Festival featured the première on October 3rd of a composition entitled "Corcach: A Journey" by Máire, Nollaig and Mairéad (The Casey Sisters), specially-commissioned by the festival for its 40th anniversary. ...started with a month-long duo tour of New Zealand (sponsored by Culture Ireland and incorporating a headlining appearance at Whare Flat Festival) in January. A subsequent bunch of UK concerts was followed by performances by Máire at Ireland's Gathering Festival and Ballymaloe Grainstore with The Casey Sisters. She and Chris then headed off to Dallas to perform as one of the headlining acts at the North Texas Irish Festival before returning to this side of the pond to do some concerts sponsored by the Arts Council of Wales, followed by a really good fun weekend playing at the Costa del Folk Festival in Ibiza (Spain). The summer included teaching at the International Festival for Irish Harp (An Chúirt Chruitireachta) and performing there with The Casey Sisters, teaching and performing at Scoil Samhraidh Willie Clancy and the Music Generation Laois Summer School. The autumn brought a fortnight touring in Ireland with Máire's sisters (during which they performed at the Cork Folk Festival and the O'Carolan Festival in Nobber, Co Meath), a six-week duo tour in Canada and the USA (during which Máire and Chris played at the Northern Lights Harp Festival, Ontario and in Québec, Arkansas, Tennessee, Louisiana, Mississippi, Alabama and Florida) and their annual duo Christmas tour in the UK. On June 29th 2017 Máire was thrilled to lead over 70 harpers in playing her composition, Harps in Bloom (Termonfechin Times), at the 32nd International Festival for Irish Harp (An Chúirt Chruitireachta) held in Termonfechin, Co. Louth - such an exciting and powerful sound! The performance was televised by RTÉ and broadcast on three news programmes and on RTÉ 2's news2day programme that day. Here's the programme - the harp segment starts right away. 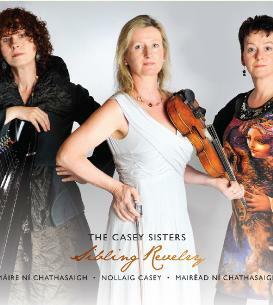 Máire and her sisters Nollaig and Mairéad (The Casey Sisters) released their first CD together, Sibling Revelry, in late 2015 and started touring with it in 2016. (Cover image and review extracts on the right.) In the lead-up to their performance at the Gathering Festival in Killarney and the Ballymaloe Grainstore in February 2017, Máire was interviewed by the Cork Evening Echo (click here to read) and all three sisters were interviewed by the Irish Examiner (click here to read). Here's a video of their performance at the Skibbereen Arts Festival. Máire on the front cover of the June-July 2017 issue of Folk Magazin (Germany)! Chris and Máire were featured on the first programme of the "Tradfest TG4" TV series, broadcast November 25th, 2018 on TG4. Watch it on catchup TV here. They were interviewed by Tom Lane for BBC Radio Lincolnshire's "Thursday Night Folk", broadcast December 13th, 2018. Listen to it on catchup here. An interview with them appeared in the Spalding Guardian (Lincolnshire) on December 17th, 2018. 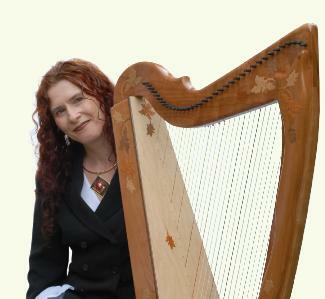 TV clip broadcast on RTÉ's News2day programme 28 June, 2017, of Máire leading over 70 harpers in playing her composition, Harps in Bloom (Termonfechin Times), at the 32nd International Festival for Irish Harp, held in Termonfechin, Co Louth. For further news, click here.